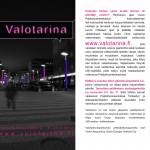 The Valotarina website [LightStories] opened finally today, allowing people to control and tell strories using the Pakkahuoneenkatu luminaires at the city of Oulu, Finland. 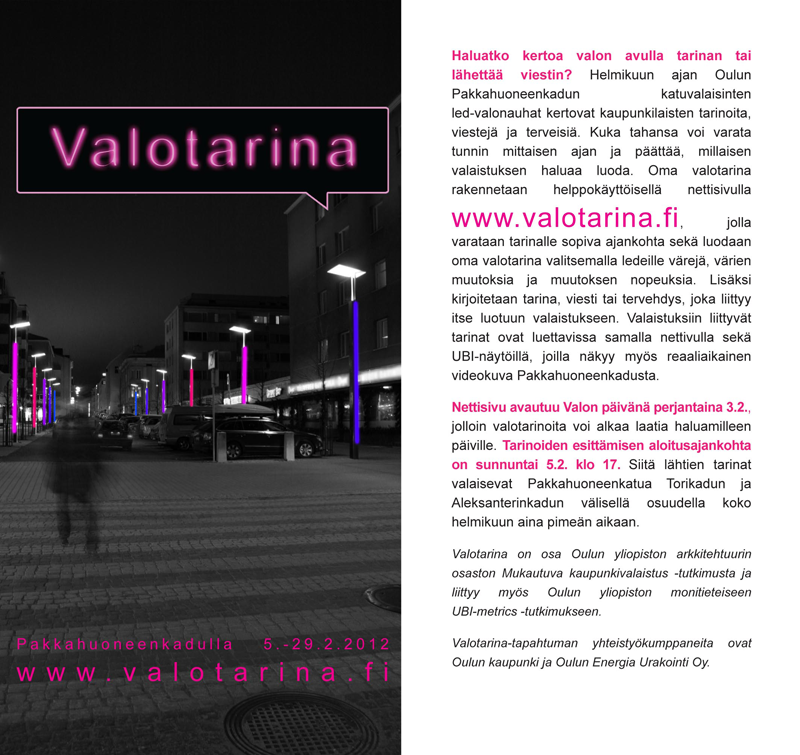 Valotarina is part of the Adaptive Urban Lighting – Algorithm Aided Lighting Design research project. The set up of the Valotarina site and the linkage of the site and the lighting control unit has been an exiting task that has demanded to search for and develop a common interface for these two elements that normally are unaware of each other’s existance. The process has required extensive scripting on the lighting control unit in order to create the different effects that users can select, their functionality and interactivity. Would you like to tell a story or send a message using light? During February (5-29 Feb 2012), the LED stripes of the Pakkahuoneenkatu street lights in the city centre of Oulu are telling the stories, messages or greetings of city inhabitants in the form of LightStories. Anyone can book a time slot of one hour to design their own lighting scheme. Each participant can create their LightStory with an easy-to-use web interface (www.valotarina.fi), where they can book a suitable time for their story and create a lighting design by choosing the colours displayed, as well as how and at which tempo they change. Additionally, users write a story, a message or a greeting, which relates to their lighting design. 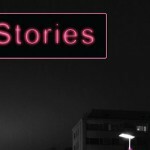 These stories are visible on the LightStories website and on the public UBI touchscreens in the city centre of Oulu. Real-time video of the street is also displayed to illustrate the current story for the website and UBI touchscreen users.